Heather is a trained nurse working in the field of child and family health, and has taught at a tertiary level in health services, as well as working as a manager with a Māori Development Organisation and in primary health care. She has completed a Post Graduate Diploma in Public Health at Otago University, a Masters in Public Health from the same university and a PhD and Postdoctoral Fellowship with Te Pūmanawa Hauora, the Research Centre for Māori Health and Development, Massey University. Māmari completed an MA (Distinction) in Classical Studies, BA (Hons), and an LLB (Hons) at Victoria University. She then spent three and a half years at Russell McVeagh in Wellington working in the Māori legal team in the Corporate Advisory Group, latterly concentrating on ACC law. John is a Senior Research Fellow at the University of Canterbury’s Ngai Tahu Research Centre. He is a specialist in leading and developing multi-disciplinary research and development programmes focused on addressing interrelated social, economic, and environmental problems. His research explores the way in which Indigenous and Western cultures shape identity, sense of place, and approaches to social and economic development. Our Call for new Seed and Scope Research proposals has opened - we will hold hui to discuss ideas, answer questions and assist; but applications must be in by 30 June 2019. 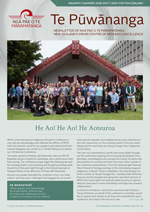 Ngā Pae o te Māramatanga (NPM) is again developing new seed and scope research that contributes to its research programme and outcomes. We will develop and commence research projects that contribute to our outcomes and vision, by providing a small contestable fund for our researchers (research partner network) that will initiate excellent research that has transformative potential.